Ah, more bitter cold. How delightful! (The sarcasm keeps me afloat.) Between frigid weather and catching various small maladies my fashion sense of late has been dis-coordinated and usually hidden under a quilt anyway, but I feel better when I dress better -- and anyway it's Sunday; I can't go to church looking like I'm cosplaying a 1930s hobo. In a cartoon. Um. 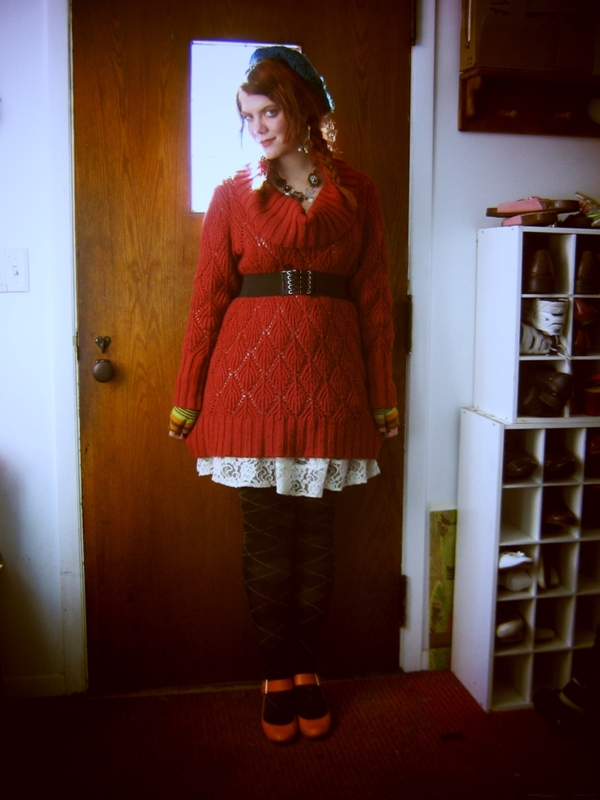 Anyway, this sweater dress (Goodwill, of course) has been something of a lifesaver this winter, as it is unimaginably warm and cosy, though slightly too large -- but a belt fixes that. (This corset-laced one is from Kyra's Christmas package.) It's also knit to be a biiiit see-through for both modesty and cold, so I wear a lacy dress underneath, which gives it an extra touch of whimsy as well. 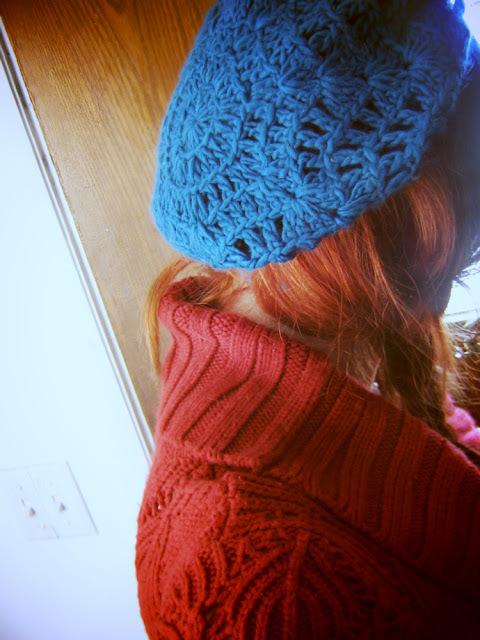 Bitter weather calls for COLOUR, and LOTS OF IT. I bought this hat and matching gloves (we ran entirely out of gloves!) on ruthless clearance at Claire's last week. Annnnd it's totally poofing wrong in the first picture; LOOK IN THE MIRROR FIRST, JO. I promise I can wear it while not looking absurd. 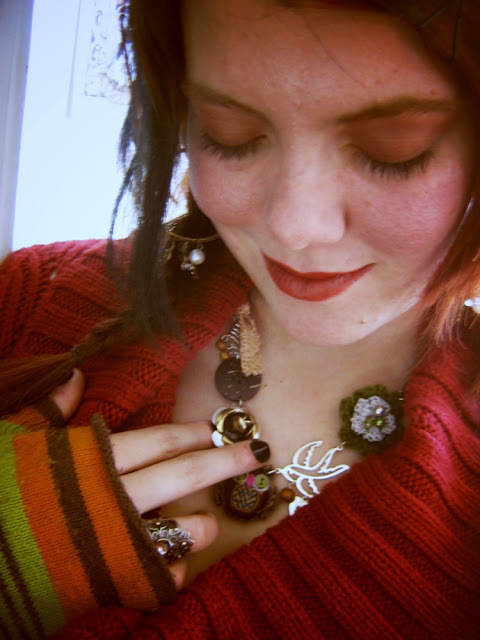 Miscellany necklace from Claire's, and warm stripey gloves from same, two years ago. 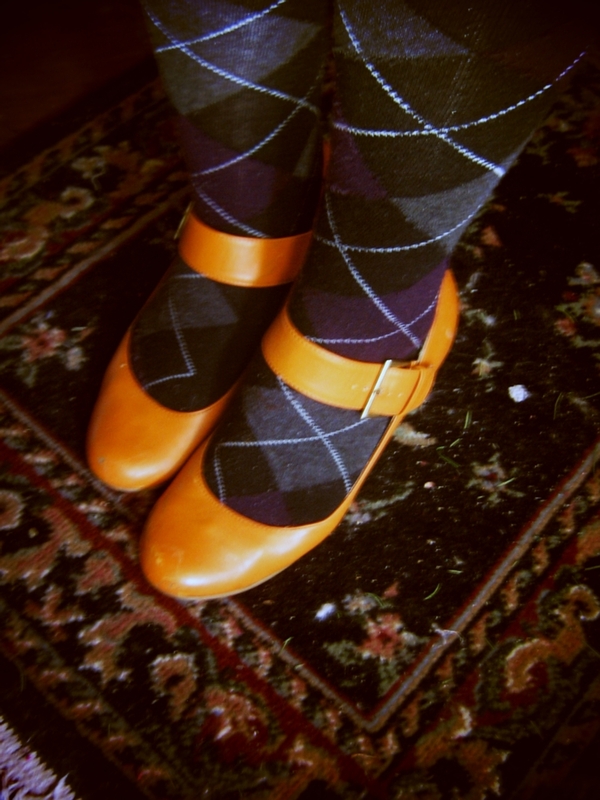 I've been mostly wearing the same two or three pairs of boots for the last month, on account of the PILES OF SNOW, and have finally had it, so pulled out my long-beloved orange heels for church this morning. I bought them at Goodwill three years ago or so and am still charmed. Stockings also thrifted, worn because they're one of two or three pairs I have that are actually really thick and warm.